Finnish Shipbuilder Meyer Turku has floated out Costa Smeralda, the first LNG-powered ship in the Costa Cruises fleet. "The float-out of LNG powered 180 000 GT cruise ship, marks the beginning of the final stage of construction for this Italian style beauty engineered and constructed in Finland," said a press release from the shipbuilding company located in Turku. She will be finalized at the outfitting pier of Meyer Turku and be ready for delivery for Costa Cruises in October 2019, the release said. Costa Smeralda will be the first LNG powered cruise ship in the Costa fleet and one of the first ones to sail the seas. LNG usage will cut all small-particle and sulfur oxide emissions and significantly reduce nitrogen oxide and CO2 emissions of the ship. “We have been very excited to bring our expertise in designing, engineering and construction of LNG ships in service for Costa Smeralda. 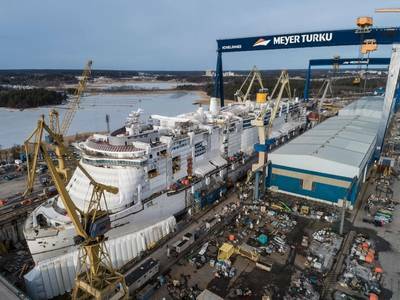 This ship is also going to be a step up in ship size for us, as we are continuing our production ramp-up to two times the level of previous high for the shipyard”, CEO of Meyer Turku, Jan Meyer, said. “With the hull of the ship now completed, the next stage of the building process is proceeding to complete all these attractions and features, making sure at the same time that Smeralda will be a safe, reliable and comfortable ship to sail at sea. After the summer the commissioning and testing of the ships myriad of automatic systems will intensify both at the pier and at sea before delivery”, CEO Jan Meyer explained.